Get pre-approved. Many real estate professional won't show you properties unless you've been pre-approved for a mortgage. And you'll need a pre-approval letter to even negotiate with sellers; most experienced listing agents will advise their clients to demand a pre-approval or pre-qualification letter up front when an offer is made. The difference between pre-approval and pre-qualified. A pre-approved buyer is one whose credit has been pulled by the mortgage broker or banker; pre-approvals are taken far more seriously than a pre-qualification when a Buyer submits an offer on a property. Feel free to call me at your convenience for a no-obligation conversation about your home shopping or selling goals! Be Prepared For "The Worst"
Is your home insured for its present worth? Check your policy or with your agent to see whether or not you have replacement value; if you do have it, is your home insured based on the probable replacement cost today, or is the valuation an old one? The last thing you want in a time of emergency is to discover that your insurance limits aren't sufficient to cover repairing the damage to your home. Living in Louisiana, there is usually a "wind deductible." It's in your best interest to know what that deductible is, if any, and whether or not you would have the available funds to make up the difference. Do you have a pictorial inventory of your home? If not, take photos - a lot of photos - and try your best to label them, including, if you know it, the purchase price of the items shown in the photos; store the photos in a print album and/or an electronic album, but make sure any printed photos are stored somewhere other than a vulnerable place in your home. A bank safety deposit box or even a friend or relative's home would be better. If saved in an e-file, be sure it's somewhere you can access it no matter where you might be. What are your additional living cost limits? If damage to your primary residence is severe enough as to make it uninhabitable while being repaired, will your insurance coverage provide a comparable place for you to live while those repairs are being done? Will that coverage also provide enough to continue to pay your mortgage? Your insurance agent will be happy to discuss these things with you, in most cases - but don't wait until you need the coverage to find out what your coverage is; it may be too late by then. Do you have flood insurance? Even some areas in Louisiana which were not in designated as flood zones have flooded in recent years; if flood insurance isn't required by your mortgage company, it would be a good idea to talk to your insurance agent about purchasing it, regardless. If "the worst" happens, the insurance costs for flood insurance in Flood Zone X is usually nominal, and comforting to have. Have a family evacuation or emergency drill. While not wanting to scare your children, it might be helpful for them to know in advance what to do during an emergency. While reassuring them that what you're practicing for may never happen, you can also turn the drills into a game, giving a reward for correct answers to "what do we do if..."
Do you have some items of specific value? Did Grandmother leave you a small Renoir, or do you have a stately Steinway grand which would be very expensive to replace or restore? Talk with your agent about a stated value insurance for those items. Remember your movable valuables - cars, boats, RVs, ATVs, etc. Do you have insurance on those items in case they are damaged by wind, hail, flood, etc? Do you have any insurance which might cover storage of them if their normal storage at home is not avaialble? No one wants to imagine the worst. But everyone should be prepared for it, while hoping that they never have to face it. 1. Take some interior and exterior photos. These narrow your focus and allow you to see your house more like potential buyers might see it. 3. Which of these would you purchase? The one on the right, am I correct? 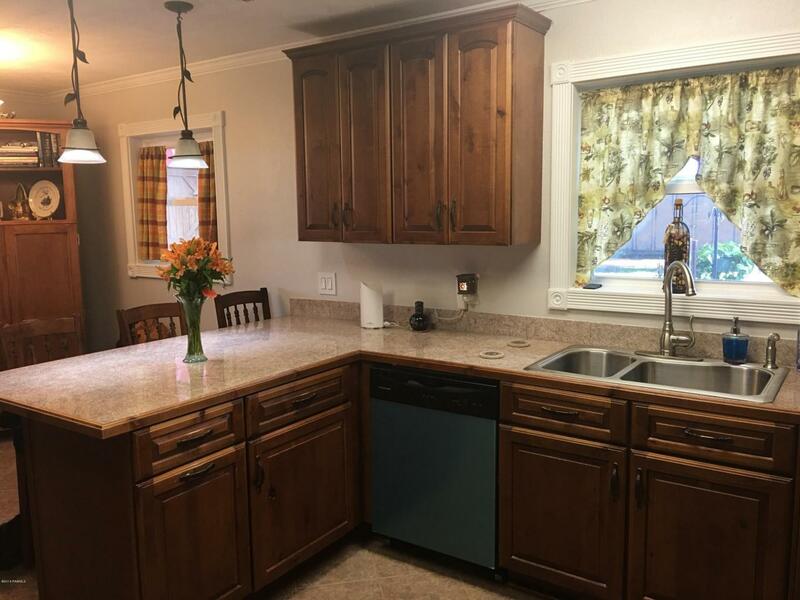 It's the same kitchen, but in a before-and-after shot once it was decluttered by the Seller. The house sold quickly after decluttering. Is Buying in Winter A Better Idea? 1. You're competing with fewer buyers for the property of your choice; most people don't even begin looking for a home until Spring. About 40% of homes, on average, are sold during May, June, July and august. 2. Sellers usually understand that their options are a bit fewer in winter, and yet they are ready to sell - so are often more willing to negotiate in winter months. 3. Your agent probably has a bit more time in winter, as Spring and Summer months a successful agent tends to be slammed - and a good agent recognizes the difference in the market between winter and the warmer months. 4. It's often less expensive to buy those "necessities" for your home during winter months - appliances, cookware, etc. Mind you, do NOT go forth and purchase on credit - don't even open a lay-away account for such things, because it can negatively impact your credit score and debt-to-income ratio; just wait till five minutes after closing, and take advantage of those winter sales. October is a great month for lawnmower sales in many places, and November is often a great month for new appliances and cookware. Not to mention those after-Christmas and New Year's sales! Take everything into consideration to see what works best for you. Certainly, winter purchasing may not work for all - but you might negotiate a sweeter deal in those dreary winter months when the real estate market slows down. In Louisiana's Acadiana region, things normally get a bit slower once kids are in school in August, and remain somewhat slower until after the first of the year. While things used to pick up considerably the day after Mardi Gras, recent years have seen great upsurges in activity starting in January. Admittedly, not everyone like blue cheese; nor does everyone like broccoli. So if you don't like one or the other (or both), this definitely is NOTS for you. But if you, like I, really love, love, love blue cheese and think broccoli tastes infinitely better when covered with something, then this just might be your new holiday favorite! 1. De-clutter! Give your house a Spartan look; only leave whatever is absolutely essential for day-to-day living exposed on your counter tops. Remove excess or over-scaled furniture (rent a storage unit, or ask Grandma is you can store some things are her place, but get it out!). 2. Make your house age-attractive. Recently I met with a lady in her eighties about listing her house. It was absolutely pristine - but the furniture and accessories virtually screamed "sweet little old lady." She had a collection of bisque babies which were beautiful, but are the type of thing mostly seen in houses occupied by - you guessed it - sweet little old ladies. Given its size, price range and location, this pristine property's most probable purchaser was a young or younger couple (perhaps a down-sizer, but more likely a younger couple). Not only did the collection make the house age-specific, it offered a very real temptation for children to want to "play" with the fragile dolls, thus giving the possibility of damage to the owner's collection. To her credit, she had them boxed up and put away in record time. 3. Get rid of "specific" colors. That barn red kitchen might have fared well for brightening your day, but something more neutral will more likely appeal to a buyer. Neutralize everything when it comes to paint - personalized colors limit your buyer pool. 4. Pressure wash walkways, porches, and eaves, and do exterior paint touch-ups, if needed. First impressions can't be recaptured with an "oops, now it's fixed" when they've already seen your house in poor presentation condition. 5. Plant some seasonal "color" in front - especially near the entrance; even bright potted plants, like red geraniums flanking the door, will help say "hi folks, come on in!" 6. Mulch the beds. Again, first impressions can't be regained, so make that first impression count! 8. When you know your house will be shown, open all blinds and draperies, turn on all lights, even on a bright and sunny day. And, most important - leave well before the showing is scheduled to take place, and don't come back till it's all clear! People feel constricted to talk freely when the owner is present, and also it gives them an opportunity to ask the owner questions without the owner's REALTOR hearing the conversation, so any controversy or misunderstanding later becomes he-said, she-said and your agent can't help because he or she wasn't present for that conversation. When real estate is rocking and rolling, selling a property is easy. Give it a dust-off, put it on the market, and sit back and watch people try to out-bid each other. But when the market goes south - whether due to national or local setbacks, selling becomes more of an art form. Inventory usually increases, prices often have dips, and properties are all competing for the same paucity of buyers. First, let's talk about appearance. First impressions can make or break the interest in a property. If the front door is faded or mildewed, potential buyers are turned off, and there is no taking back that first impression. Buyers interpret neglected entrances as a sign of more far-reaching deferred maintenance. Power wash the entrance, touch up paint or stain, pot a couple of potted plants with a pot of color - red geraniums make a splash - and create a welcoming environment. Ever Seller thinks their property is special. Especially in down markets, it's essential for a Seller to think like a Buyer - look at your property as though you were buying it. Nail holes where pictures once hung, or flat, listless finish on your flooring? Perk it up! Don't just try to patch walls and "touch up" the paint - even when applied from the original paint can, the paint will not match; the paint on the wall will have faded, while the paint in the bucket stayed fresh. Paint the entire wall - quick fixes can work against you. Don't spend money uselessly. Ask a professional REALTOR which items will bring you a return on your investment, and which will be wasted money. Kitchens and bath usually have the great return, while things like swimming pools return perhaps a fraction of their original cost. Price competitively. Yes, you do need a little "wiggle room," but pricing considerably above market price is counter-productive. Instead, stick to your price. Pricing considerably above market value is a huge mistake. How do you price your house. NOT with a "Zestimate" from Zillow or any other free website; most Multiple Listing Systems don't allow such sites to have their "sold" data, so the companies "estimate" what a house might have sold for - more like a guesstimate. Licensed professional REALTORS have access to that data, and can help you price the house competitively - and have the resources to market your property. During a down market, it's important to have not just exposure, but the right exposure. Want that great exposure and the correct pricing? There's one ready source: Just Ask Allen. I'm often asked if this is a good time to buy a home. Some clients are concerned that home prices may fall down the road, while others are convinced that home prices will go up. Home prices are one factor in determining your cost of ownership, but so are interest rates and financing availability. Even though interest rates have fluctuated, they are still near historic lows. Since your monthly mortgage payment is a combination of paying down your principal and paying the interest owed, a one point rise in interest rates could cost tens of thousands of dollars over the life of your mortgage! While a home is a major investment, it is also the center of your personal life. It's important to live in a home that reflects your taste and values, yet is within your financial "comfort zone." To that end, it may be more important to lock in today's relatively low interest rates while they are still available.